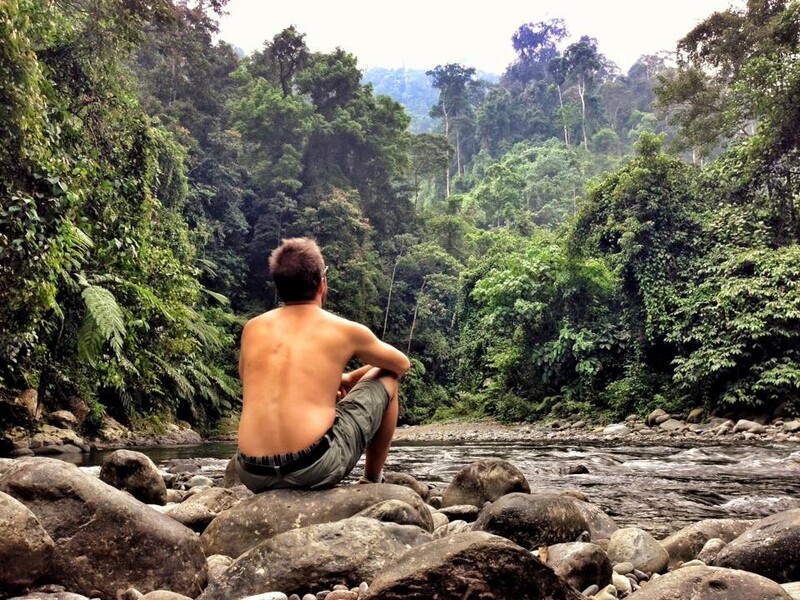 Guestbook-Jungle Trekking in Bukit Lawang - Jungle Trekking Tours in Bukit Lawang,Sumatra! I really enjoyed the 3-day Trekking Tour ! We saw many Orang utans and Even some with babys! They joined us during lunch and were really curious! We also saw some Gibbons. Our guides were Nice and spoke very good english. The Food was also very delicious and freshly cooked. The campsites were beautiful and next to the River. I would do the Trip again, Thank you for the Nice experience ! I really enjoyed our 3-day jungle trekking tour. We saw a lot of orang utans. The food was lovely and the guides were amazing! Had such a good time with you. Thanks so much. I can highly recommend it! We, myself and my two daughters, signed up for the two day trekking program in Dec 2018. It was amazing to be in the jungle and observing animals on their turf. The hike was not a easy one, and our guides, Jim and Sardy did a fantastic job showing us around and did all the heavy lifting, literally, of the food and supply. They spotted creatures with their eagle eyes and showed us monkeys, orangutans, gibbons, and etc. The set up at the camp by the river is well stocked for being in a jungle and the cook was able to prepared a very good meal. We were well taken care of. 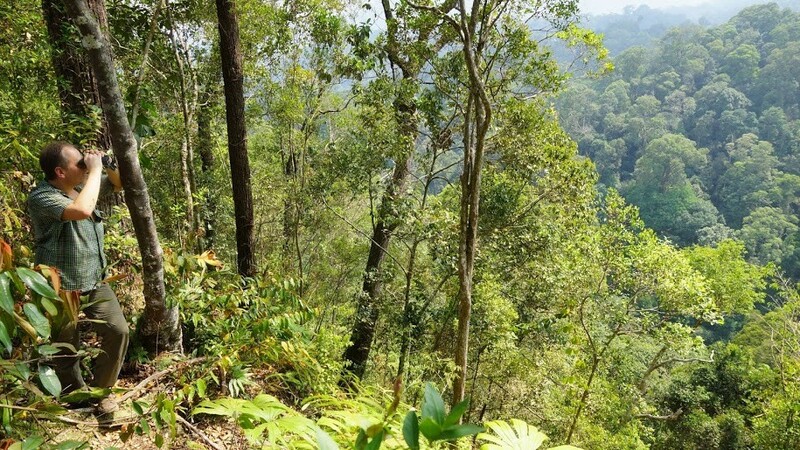 BukitLawang Jungle Trekking managed the Medan airport pick up, home stay at Bukit Lawang and trip back to Medan. It was very convenient, professional. I would highly recommend it. Nous sommes partis en petit groupe pour un trekk de 2 jours 1 nuit. Le rythme de la marche était parfait et adapté, les guides toujours très agréables, nous donnant des informations sur toutes les magnifiques espèces qui nous entouraient. Nous avons vu beaucoup d' orang outang et de nombreux autres singes... Nous nous sentions à l'écart du monde mais toujours bien entourés ! La soirée au camp était également magique. Nous avons pu partager un bon repas sous les étoiles avec notre groupe. En résumé je recommande les yeux fermés ! Terima kasih, danke sehr, merci beaucoup ! Merci à Easy, Martin et tois les autres guides ! Vous êtes au top !! This has been simply the part best of my trip to Indonesia. We've never had an experience like this before, and we simply loved it. We spent 3 days on trekking (2 nights), and we enjoyed every single part of it. 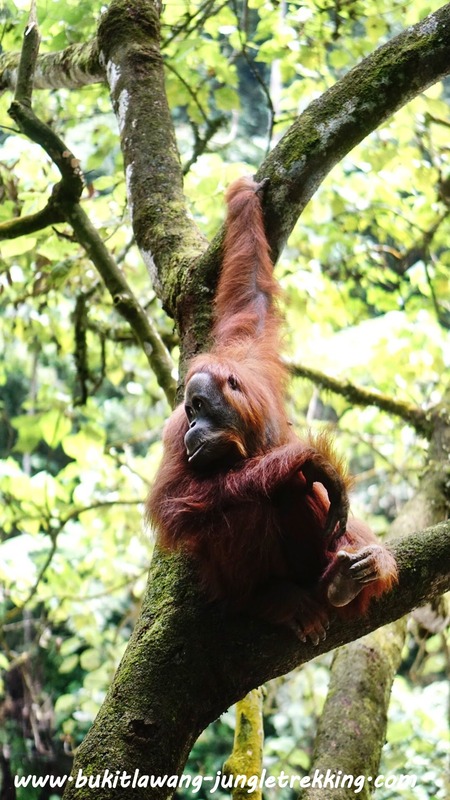 We saw many animals, especially the amazing Sumatran orangutans, swam in the river, exchanged many interesting insights with our guides, and we did tubbing down the river back to Bukit Lawang on the last day (it is a MUST!). Breathtaking jungle trek, it has been simply awesome! Bukit Lawang has exceeded our expectations!!! We organised a 3 day jungle trek, cooking class and Elephant sanctuary trip all through B-L Jungle Trekking, over our 6 day stay in Sumatra. All the trips were great. Our guides in the jungle really took care of everyone. The food and snacks were really good. Our cooking course was an experience and again our guide even took us to the food market in the morning and ensured we saw lots. 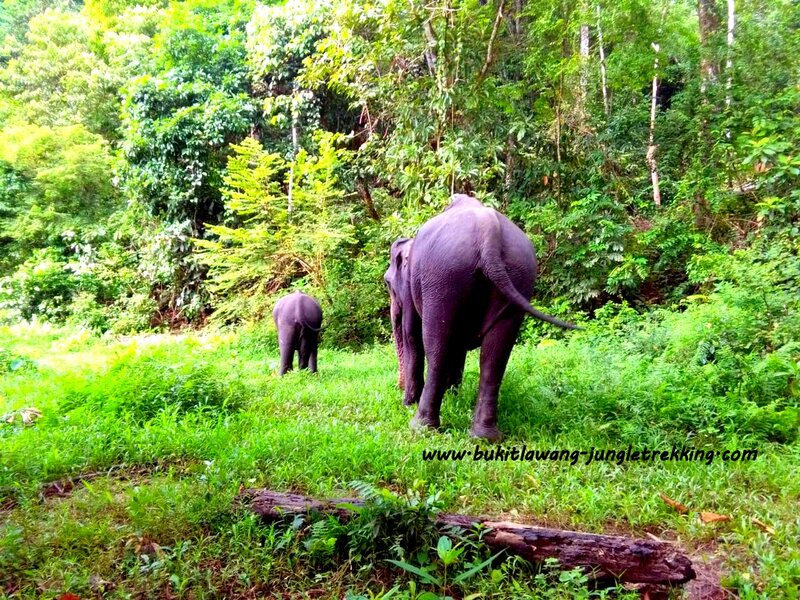 The Tangkahan elephant sanctuary is a long drive but definitely worth it. 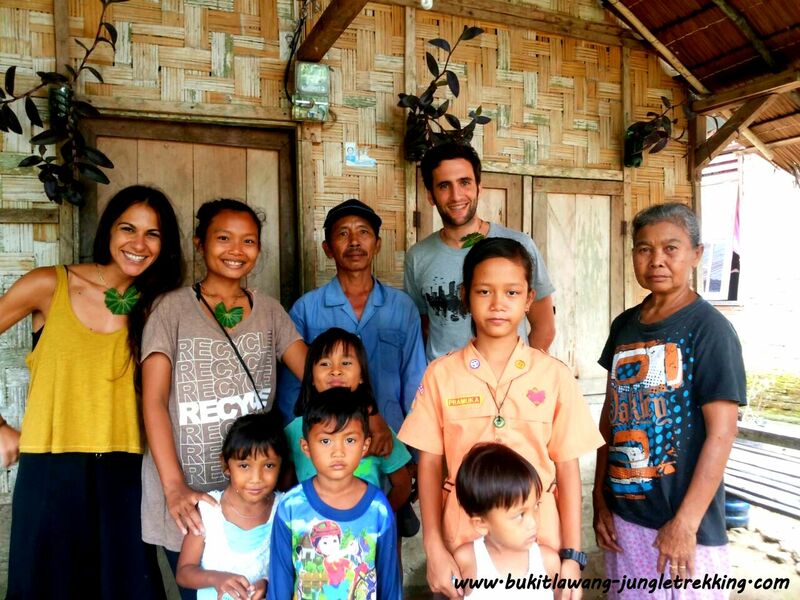 BLJT even helped us with accommodation and made sure we ended up with good family accommodation in Bukit Luwang. 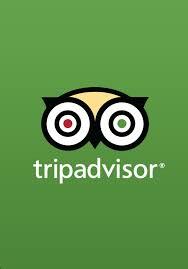 We would highly recommend this tour company as all our questions were answered and our expectations were definitely met. Vanuit België deze privé-tour geboekt voor mijn man, zoon van 12j. en mezelf. 2 dagen, 1 nacht. Al na een uur of 2 zagen we 3 oerang oetangs. 1 met een baby. Veel andere apen, toekan, pauwen, varanen gezien. De gidsen Adi en Erwin waren super lieve mensen. We kregen een zeer degelijke uitleg. Je voelt dat Adi dit met hart en ziel doet en zeer begaan is met het natuurbehoud. Hij is ook voorstander om de dieren niet te voederen en ze in hun natuurlijke habitat te houden. De beide gidsen zorgden ervoor dat we in ons kleine groepje zoveel mogelijk zagen. Onderweg kregen we fruit, ongelooflijk hoe ze dit doen, Erwin had alles mee in zijn rugzak en toverde telke malen een prachtige fruitmand tevoorschijn. In het kamp hadden we een kok die voor ons een uitgebreide maaltijd maakte. Zeer lekker! Adi trakteerde ons s'avonds op enkele goocheltrucs. Adi Copperfied!!! :-) De overnachting in de jungle was ook een unieke en superleuke ervaring. Op de 2de dag nog een korte trek gedaan en dan terug naar het dorp met de tubing, lekker genieten. Kortom, iets om niet meer te vergeten. En zoals Adi zegt: machtig, prachtig! Nogmaals onze dank aan het volledige team. From we e-mailed Janine and Dodi the very first time, we felt we were in prof. hands. Prompt replies to our questions, changes and requests. 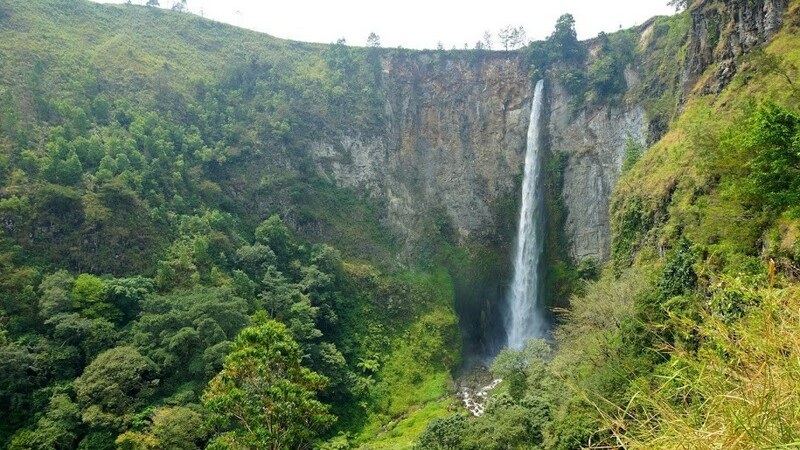 We booked 2D1N trekking together with private transport Medan-Bukit Lawang , and after our trekking tour further on to Lake Toba and back to Medan. Every single arrangement went exactly as agreed and planned. So here is thanks to our guides and cook; Daniel, Andy and Robin. We were in the best and most competent company, Daniel's English and expert knowledge of the jungle, Andy who was so good at at finding orang-utans, and Robin the best chef ever! After a long day's walk we relaxed in our camp, had a swim, a lovely evening in the company of our guides and slept in our own shelter with mosquito net, mattress and pillow. We did the rafting back which we can recommend - we got wet but not our belongings. We can highly recommend others to book simular . Our transports were with good and helpful drivers. 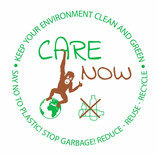 ps: great to experience how dedicated the guides were concerning trash and plastic. The guides picked up what ever was left on the ground and brought it back to the camp! We booked the 2 day 1 night tour through Dodi who was extremely helpful and friendly. The tour was absolutely fantastic, we had brilliant guides who were very knowledgeable about the jungle and animals. The trek was great fun and everyone was very respectful of the animals. I felt this was a very ethical way of getting to see the orangutans in their natural habitat, it was an amazing experience. The food was great and we slept well in the jungle. I highly recommend this to anyone. Thank you Jonny and Martin for being great guides! Inzwischen sind wir wieder gut in Deutschland angekommen. Nochmals herzlichen Dank für den tollen Dschungel Treck! 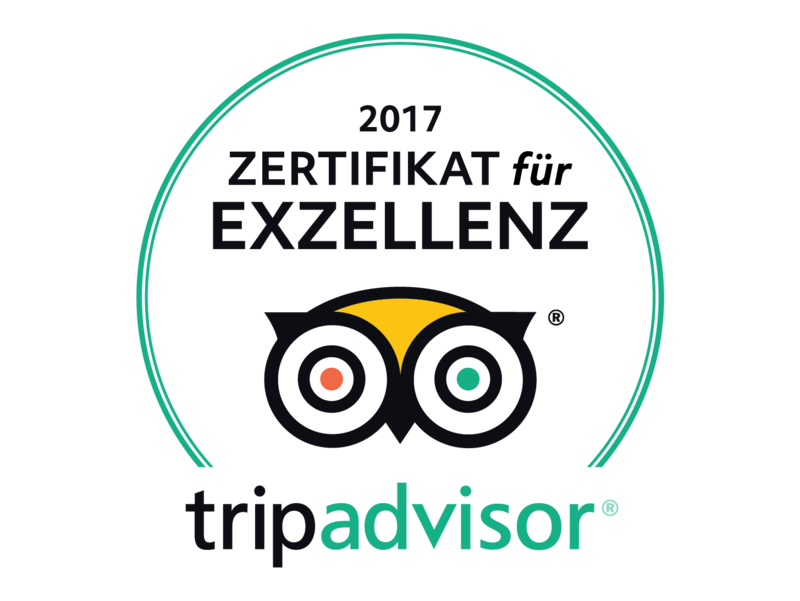 !� Es war soooo schön, unsere Vorfahren aus nächster Nähe beobachten zu können und unsere Guides waren sehr lieb und haben sich ganz toll um uns und alles gekümmert!! 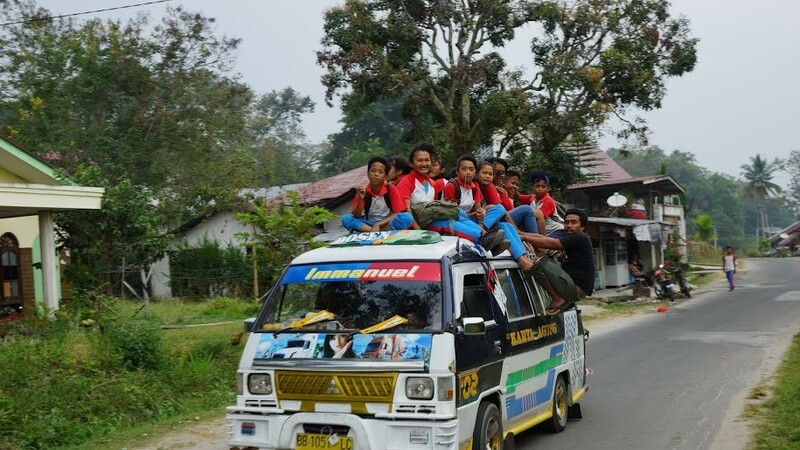 Auch der Transport vom Lake Toba nach Bukit Lawang hat super geklappt! Euch weiterhin viel Erfolg und alles Liebe! Very pleasant stay and awesome jungle trekking. The trekking was professional, all inclusive (the food was just stunning!) and I felt save all the time. Both guides were great and I also appreciated the deep knowledge about the animals and jungle itself. We also stayed a few nights at the accommodation. The place has a great atmosphere, everyone is so nice, happy and helpful. I really like the restaurant, not just the food was tasty, but there are many people coming in, someone always plays guitar and all together it creates a nice evening. I would recommend it to anyone. Thanks Dodi & Janine and their great team for great days spent in Bukit Lawang, we truly enjoyed it and will come back if we'll be around. Good luck guys you're doing an awesome job! We booked the 2 day one night trek through Janine and Dodi for November last year. They were really helpful, booking us in to the guesthouse and arranging our transfer to and from Medan airport, everything was sorted for us. The trek was a great experience, the guides were really nice and always there to help with the difficult climb or to explain about the different animals and plants that we were seeing on the way.. We had amazing food and played games in the camp in the evening and then visited a nearby waterfall the next day before rafting back to the village. I'd definately recommend it. I did a 2 day 1 night trip. It was absolutely amazing. The untouched nature and the home of many monkeys, makes it a true experience. Communication with Janine and Dodi went very well: fast and clear. The guides are really nice and caring. They make sure that you arrive at the riverside in one piece, but also give you mental support when it's getting difficult to climb. The riverside is very relaxing and the food they prepare is very nice. Rafting back is really cool and is a great ending of the trip! However, the jungle tour was not my only trip. 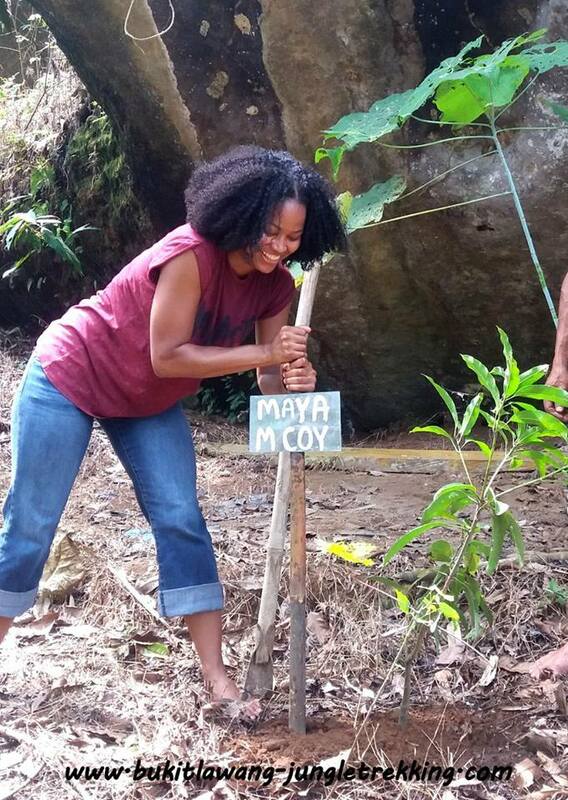 I also did the batcave trip and the coconut carving workshop. 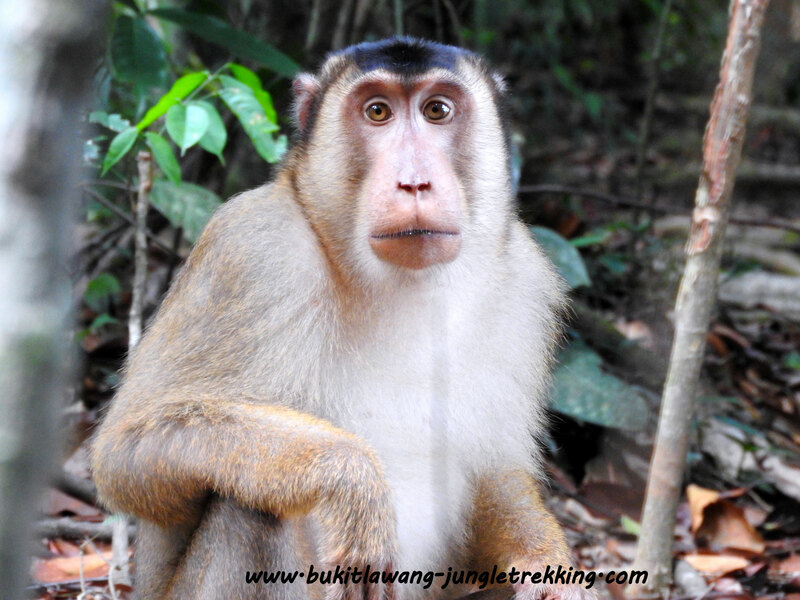 I can really recommend planning your trip to Bukit Lawang with Dodi and Janine. I had an amazing weekend. Thank you Janine and Dodi. Sampai jumpa hopefully. We did a three day jungle trip and it was a wonderful experience. All the family enjoyed the jungle treks (although it was hard work at times but rewarding). We saw lots of orang-utans and took many photos. The jungle was genuine and the tent accommodation and food made you feel that you were in a real jungle trip. 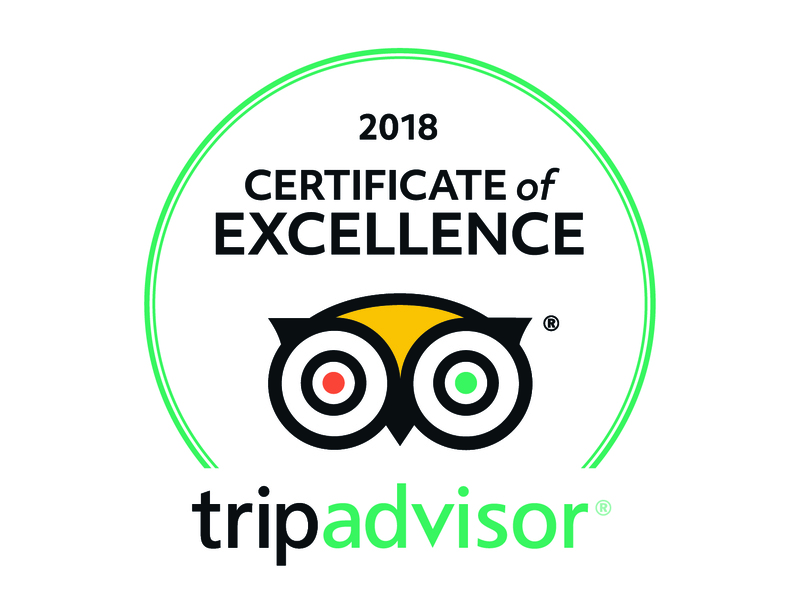 The guides were wonderful and very knowledgeable - also very patient with all of us (particularly as we are not very young) but the children had an adventure every day. We would certainly recommend them. A few weeks we (my partner , our son and myself) did the two day jungle trekking. It was a wonderful experience. Lots of monkeys and Orang Utans, a large lizard, delicious food and last but not least our wonderful guides Adi, Sardi and…..They helped us walking in the jungle when the track got very steep, helped us with carrying our luggage when it seemed to be too heavy, told us about medicinal plants, entertained us with some magic (card) tricks which I still don’t understand and cooked delicious food. I have never known that pineapple can be so tasty! We sttill greatly enjoy the memories of this wonderful trip. Just got back from the three day Trek in the jungle which included about ten hours trekking and a raft trip back to the jungle town of Bukit Lawang. All in all a super trip. Our guides Ronny and Easy treated us really well, had grown up in the jungle so were able to help us find the most beautiful routes. The food was great, stuffing myself with so much pinnapple each time we stopped for a break. Easy showed is lots of card tricks and kept us entertained before we drank our sweet ginger tea before bedtime. Accommodation was super but just what is required out in the jungle. Definitely do the raft trip at the end... You get drenched! 10/10, make sure to ask for Easy and Ronny! My partner Ondrej and I spent an amazing week in Bukit Lawang this August 2017. It seems we even brought a bit of it back to Ljubljana, Slovenia with us, as the place and the people remain in our thoughts (alas, no playful gibbons wake us up in Ljubljana with their funny morning sounds). We booked our 3day/2night jungle trek with Janine and Dodi, who put us up at their guesthouse Bukit Lawang Indah and also arranged our transfer from Medan airport despite our late arrival, so we started off with a great night ride to Bukit Lawang. 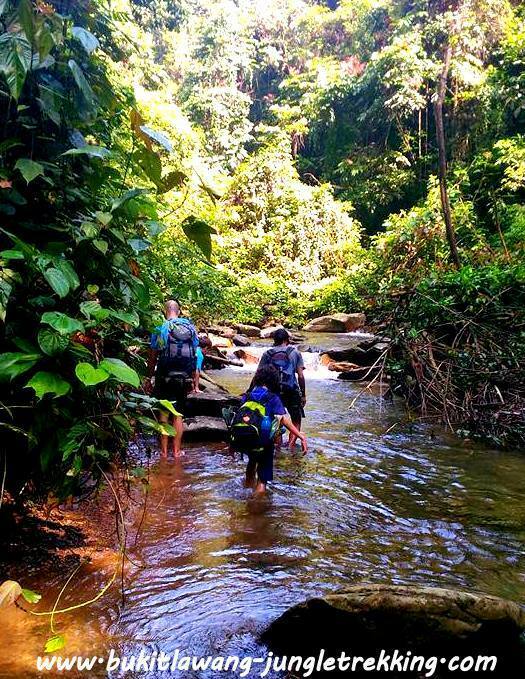 Our 3day jungle trek was one of the most beautiful experiences. 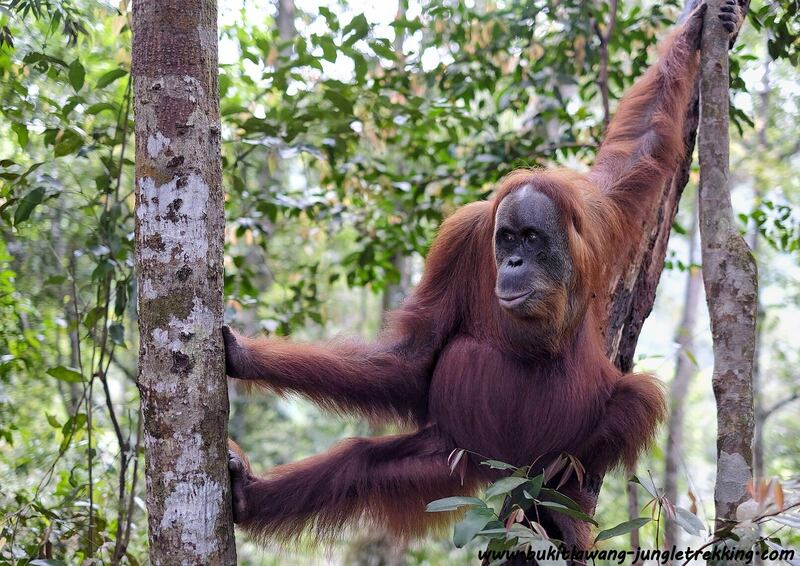 Of course, encountering no less than 9 orangutans including 2 large males up close is unforgettable. But as our expert guide par excellence Adi would say: “This is not a competition”. And what made our trip and time so truly great were the amazing people: our incredible guides Adi and Ronie and our master chef Daniel - they rule! 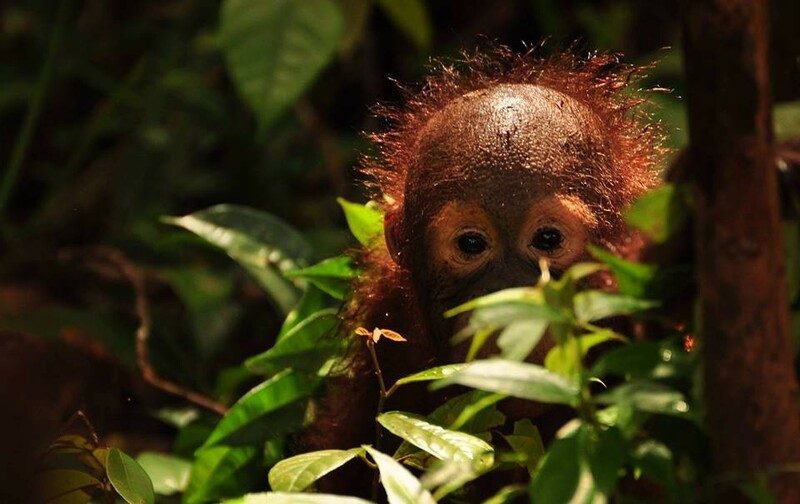 People write about guides feeding the wildlife, and during our trek we also encountered some groups who, in our shared opinion, went too close or guides pressured by tourists to chase down more orangutans. But Adi and Ronie are the opposite. As one of the guides with the most seniority and experience, Adi is the person you want taking you into the jungle: he‘s knowledgeable, thoughtful and respectful of the environment, the animals and the people in his care, he loves what he does, but when night falls and it’s time for some card games and tricks in the middle of the jungle, he’s gonna make you laugh till you cry. Our last climb down to the second camp proved too overwhelming for me, it was very steep and I have a bit of a fear of heights, but that’s where Ronie came in: he kindly sent my partner on his way and then guided me down like the best and most patient climbing instructor, step by step and liana by liana, at the most difficult passes even holding my hands – in what we came to call “the jungle tango”. My deepest thanks, Ronie! Last but not least, we never expected to have the best dinner of our lives in the middle of the jungle, thanks to Daniel. This was a feast, mind blowing! Also, thanks for a great time to our very like-minded fellow travelers Anneloes, Sander and Kevin. And a piece of advice to future fellow travelers: when you return from the trek, exhausted but so happy, make sure you don’t just rush off, but take some time in Bukit Lawang to relax, take in your experience, sit on the terrace of Dodi and Janine’s place, have a Bintang and listen to the guys playing the guitar. Thank you for everything, Dodi & Janine & your team!! 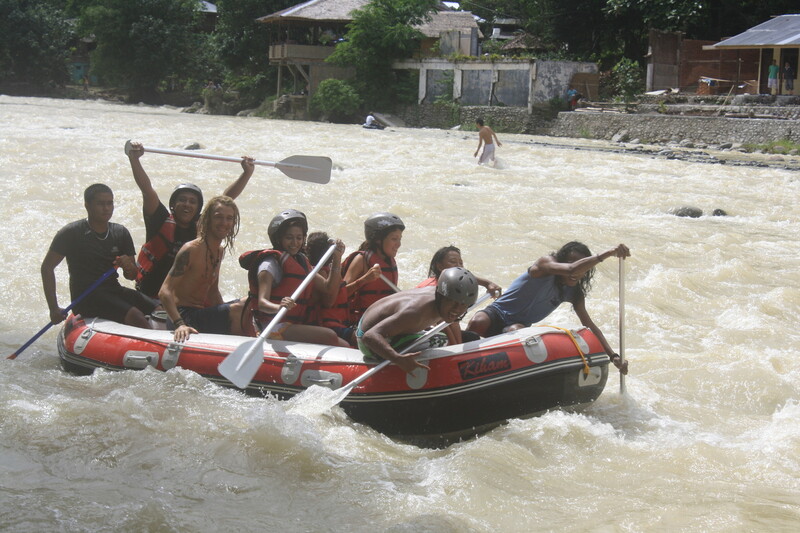 Keep Bukit Lawang the incredible place that it is. And where we hope to return. 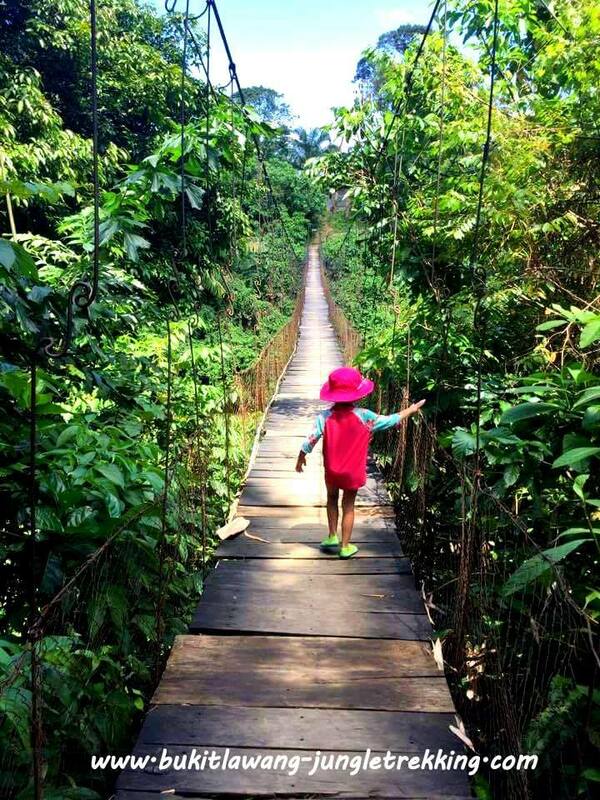 "Jungle trek, Jungle trek, in Bukit Lawang..."
actually I don´t know how to describe this beautiful nature we saw, the sounds of the rain forest, the "Wow" when we saw all the monkeys...and how much fun we had with Erik and Sardi in the Jungle. Thank you so much guys, we enjoyed our two days trek in the Jungle a lot. Trekking and singing in the Jungle, jumping into the river, hearing storys about Orang Utans and Playboys of the Jungle, see all the beauty of the forest and his animals...you made that trip for us unforgettable! 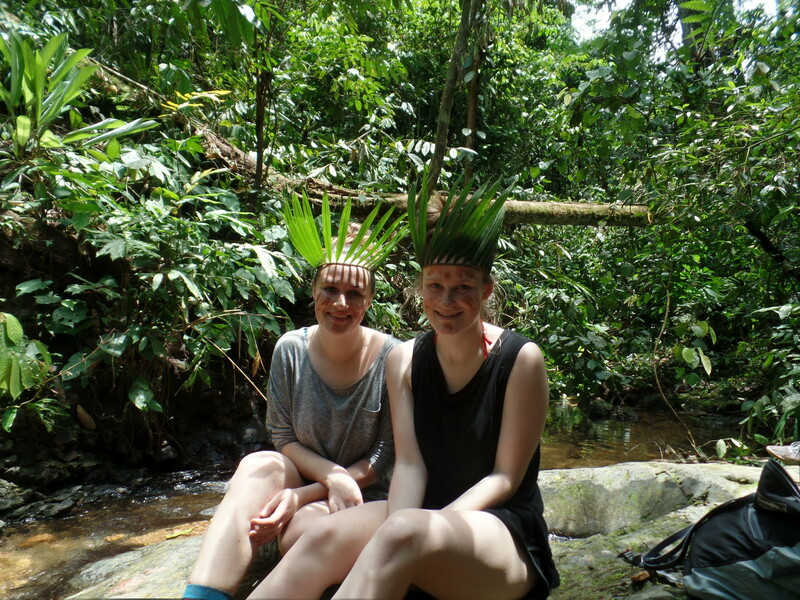 Our Bukit Lawang Jungle trekking experience was absolutely wonderful and the highlight of our Indonesian Adventure! The guys took such great care of us from beginning to end! I was traveling with my mother who is in her 60s. 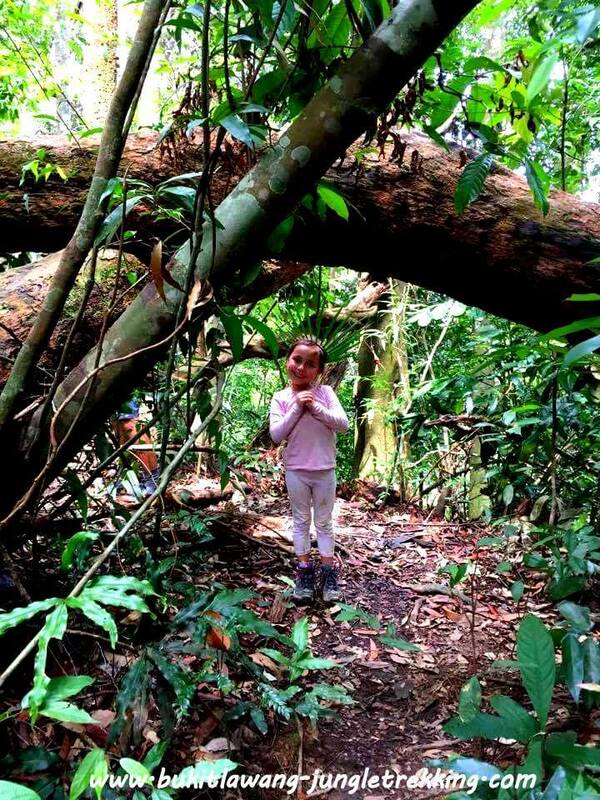 Her dream was to see Orangutans in the wild. She was nervous about both being in the jungle and hiking on our three day trek. Our guides quickly eased her nerves as they took amazing care of us. Our three guides Easy/Ardo, Andre and Ronie became my jungle brothers. They worked so hard to make our experience wonderful and to keep us both safe. They were amazing! They fanned my mother when she was hot, massaged her shoulders during times of rest, carried her belongings, held her hand for hours as the trail was difficult, pushed her in a raft when we needed to cross the river, swam next to her when she wanted to float in the river current and doted on her every move. I felt at ease knowing my mother was %100 percent cared for. Our guides all spoke great English and taught us many things about the flora and fauna of the jungle. 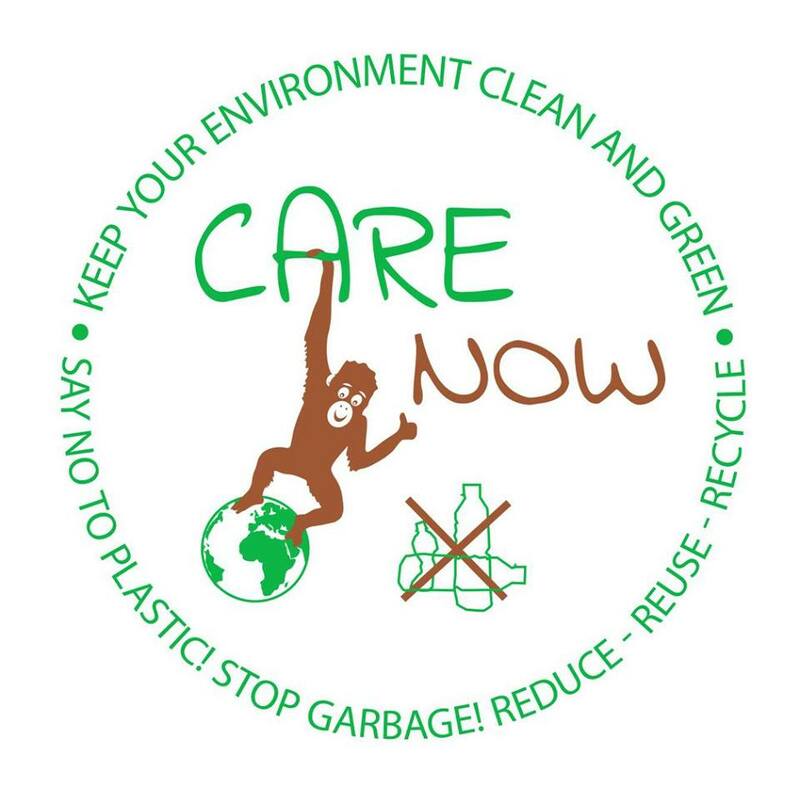 It was great to see how much they truly cared for the rainforest and the orangutans. We saw guides from other tour companies feeding the wildlife. Our guides strongly opposed this and expressed how this was not in the best interest for the apes. We were able to see 12 different orangutans, the white handed gibbons and all four species of monkeys that live in the forest! 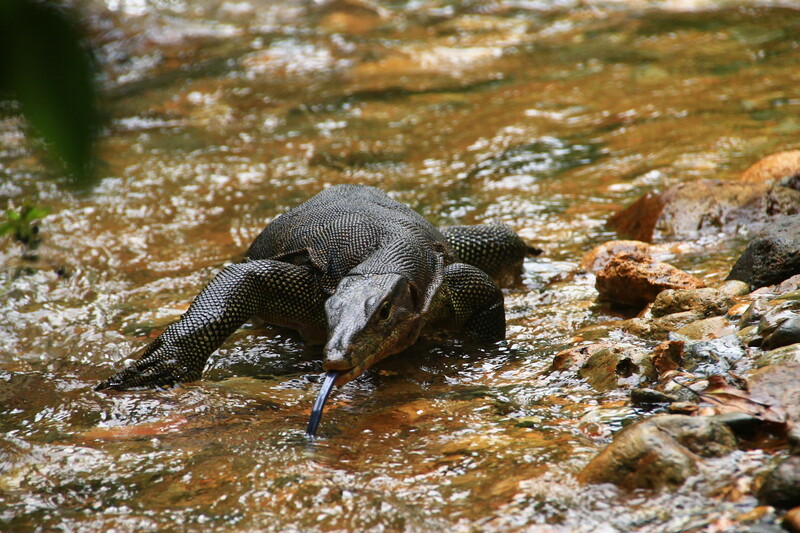 We also saw many other cool reptiles and insects that live in the jungle. Our guides pointed out many things we would not have seen without their keen eyes and allowed us plenty of time to observe and enjoy the jungle and it’s animals. Another thing that was amazing was the food. I was not sure what to expect, but they fed us like queens. We had our own cook who made us amazing Indonesian food. We had 8-9 different dishes during dinner, some of which the ingredients came from the jungle. 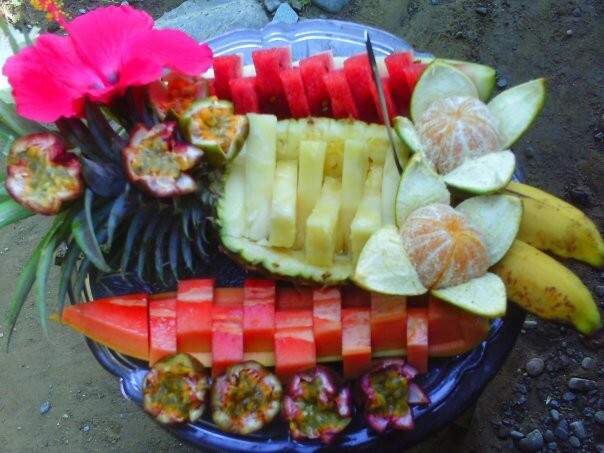 We had the freshest fruit throughout our trek and even had BBQ’d chicken on a spit by the river for lunch one day. There was more food than we could eat! We had such a memorable experience! There is not one negative thing I could say, the mosquitoes weren’t even bad. I totally recommend a Bukit Lawang Jungle trekking experience. If you are super lucky, Easy, Andre and Ronie will be your guides! nach 3 wunderbaren Wochen sind wir nun wieder zurück in Deutschland. 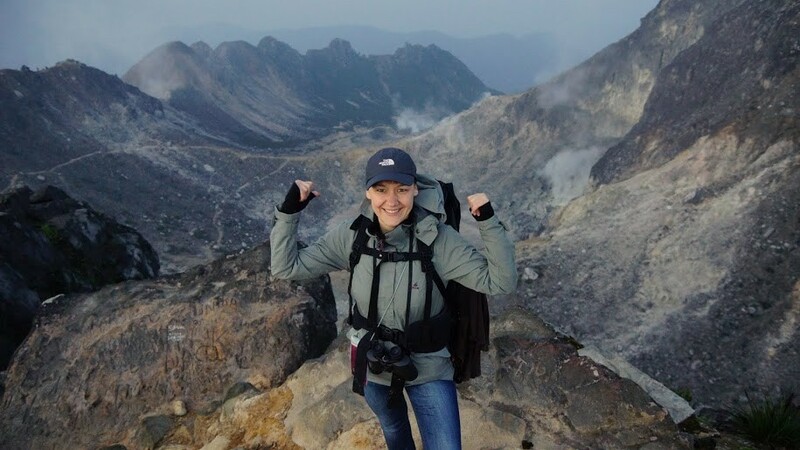 Unsere Reise in Singapur & Indonesien war in jeder Hinsicht und mit all Ihren Bausteinen unvergesslich und wirklich perfekt. All die spektakulären Landschaften, lebendige Städte, Vulkane, das Meer… DER REGENWALD. Ja, der Regenwald. Dieser Teil der Reise hat uns am aller besten gefallen. Abgesehen von diesem einzigartigen Lebensraum mit seinen wundervollen tierischen Bewohnern die wir während des 3 tägigen Trekks mehrfach bewundern durften, waren es insbesondere auch die Menschen die uns sehr beeindruckt haben. Angefangen von dem netten und zuverlässigen Kontakt während der Planung bis hin zur Organisation vor Ort. Unser super Fahrer (Name leider vergessen, sorry) der unzählige Stunden auf uns warten musste, da wir Verspätung hatte und uns auf Hin- und Rückweg gekonnt und sicher durch den unfassbaren Verkehr in Medan gebracht hat. Jimmy der uns dann um 02:00 Uhr morgens mit bester Laune durch den Strömenden Regen zum Jungle Inn gebracht hat. Ein so herzlicher Empfang bei euch im Restaurant…die Betreuung eures gesamten Teams hat uns einfach nachhaltig beeindruckt. Danke deshalb noch einmal an Jimmy, Sardi, Daniel und Adi. Die Tage in Bukit Lawang waren wirklich ein Erlebnis, das wir nicht vergessen werden. Wir haben uns in jeder Situation so super aufgehoben und sicher gefühlt. Immer eine helfende Hand, wenn man beim Klettern nicht mehr konnte, absolute Professionalität bei der Etwas „aufregenden“ Begegnung mit der sagenumwobenen Mina, und einfach die besten „Chaos-Autoreifen-Rafting-Kapitäne“ die wir kennen!! Alle Daumen hoch hoch hoch!! 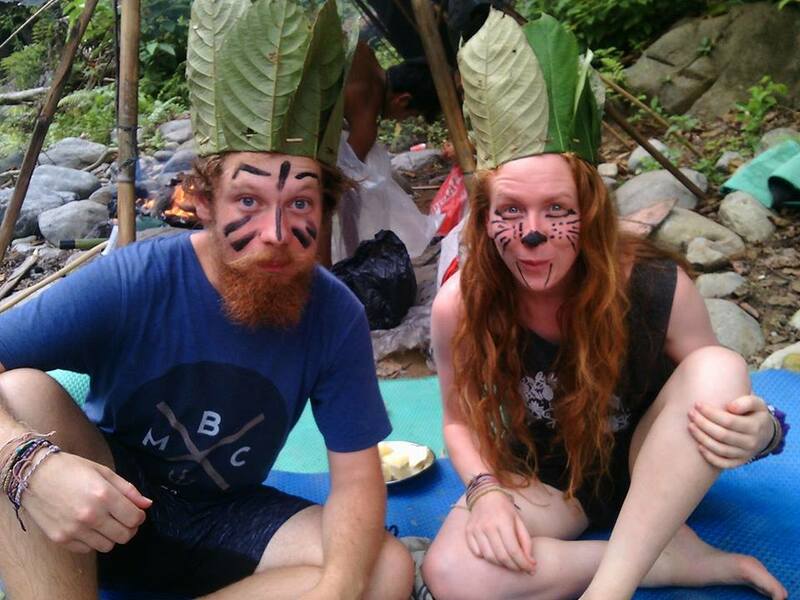 We had the best time with Bukit Lawang Jungle Trekking and really did not want to leave the jungle! Everyone was so friendly and helpful and Dodi made us feel right at home upon our arrival. Our guides Easy and Ronnie were so much fun and also experts at their jobs. We were able to see many orangutans and also other wildlife such as a peacock! Along with the hiking, we spent time tubing, playing games, singing, and swimming in the river. Highlight of our time in Indonesia. Hope to come back and do the 5 day trek! :) Thanks for an amazing time in Bukit Lawang! 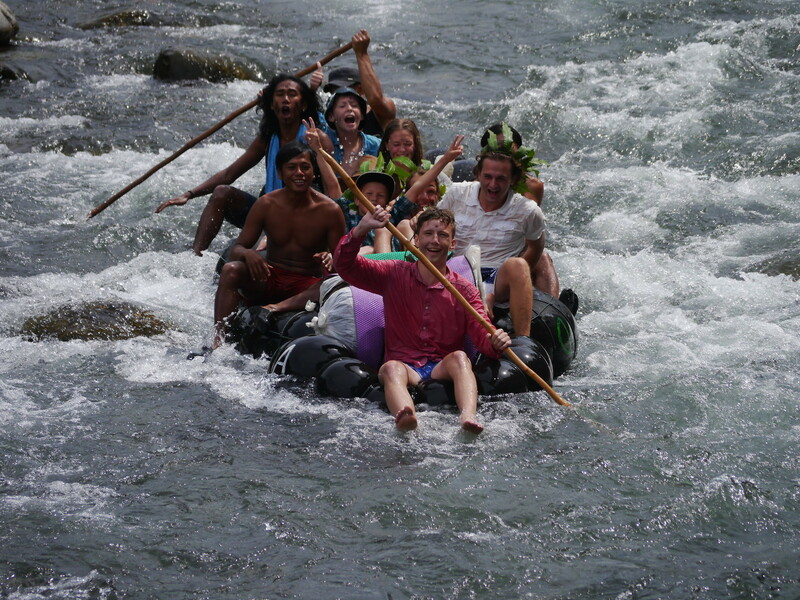 We had such an amazing time in bukit lawang thanks to Bukit Lawang Jungle trekking. Dodi was very welcoming when we arrived. The two day jungle trek was amazing, also because of our guides Jimmy and Ronnie. Special thanks to Ronnie who was so helpfull during the hard trek. We had so much fun with him and he let us to the male orang oetan. 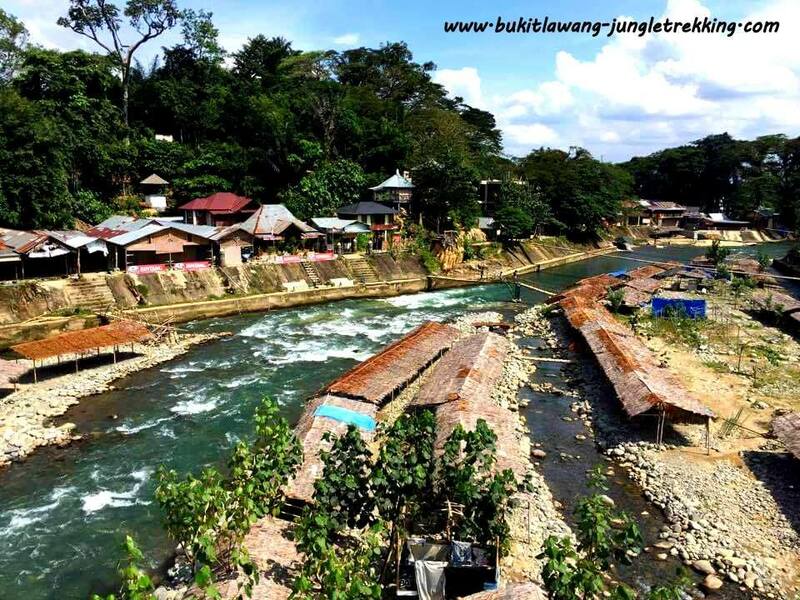 Bukit Lawang is an amazing little village in the jungle. I loved the culture, the atmosphere, the people, the nature, the wildlife and the food! This is definetely my new happy place and I cannot wait to come back. 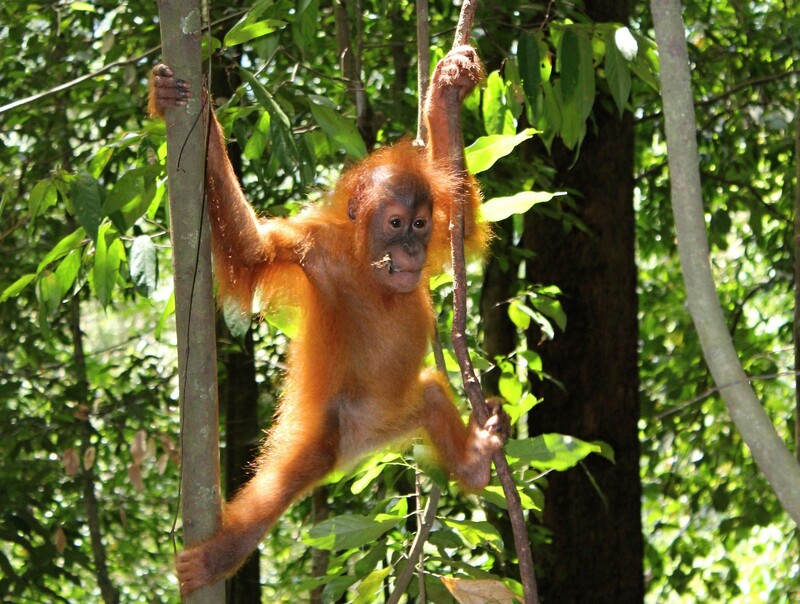 The Jungle Trek is simply amazing, we saw so many orang utans! Beuatiful little village. 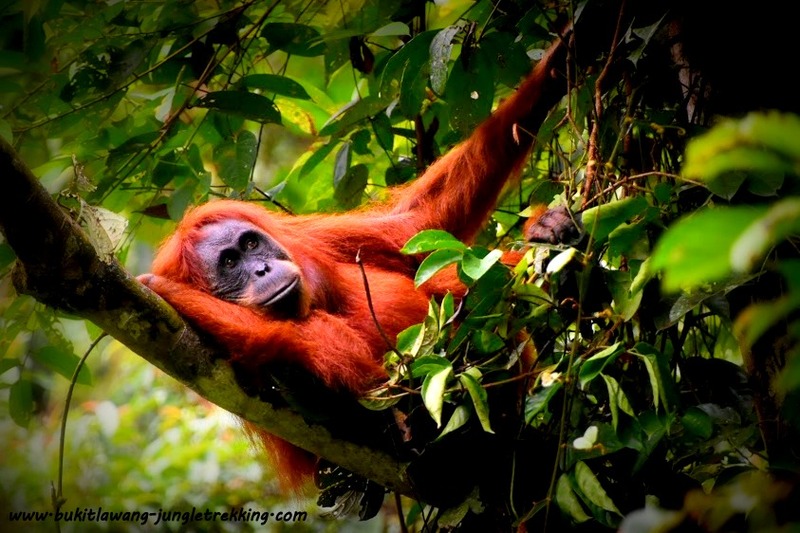 The trekking was amazing and the Orangutans were out of this world. But what really made the experience were the amazing guides led by Harry and his team. Dodi was a wonderful host and made us feel like family. He even called in some friends to play some guitar and sing for us the night we returned from our trek. We will always remember this amazing paradise. Harry and his card tricks in candle light while listening to "jungle music" at night. Ask for Harry to guide you and you will not regret it. Amazing person he is. Dodi thank you very much for everything. Can't wait to come visit again in the future. Thanks Johny for the very good trecking. I make a 3 day trecking with Johny and Rony. They will be very nice, good and competent guides. They everytime have had a very good view of all of the group and keep care for everybody into the group. 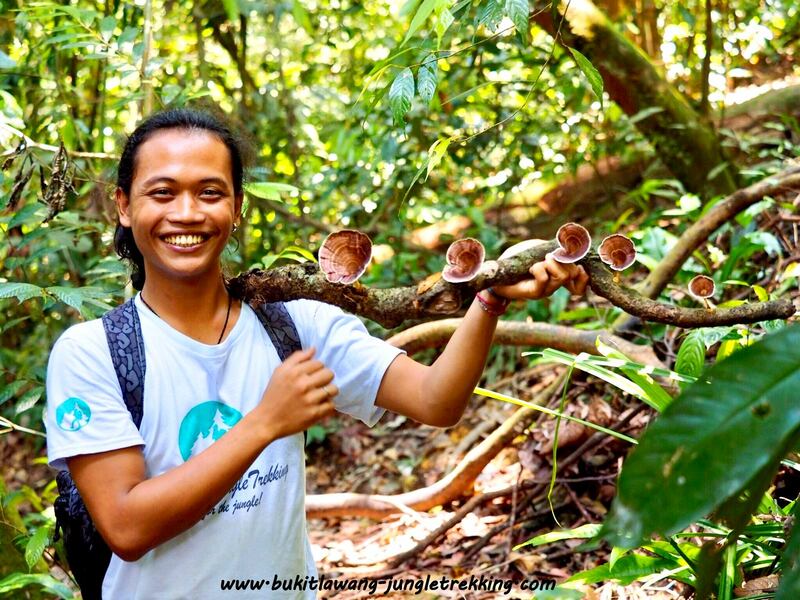 Johny is a specialist in find and comunikate with the Orang Utan. I never will forget this moment, we are still allone into a part of the jungle and he find a Orang Utan far away in the top of the trees. He will comunicate with him that it will slowly come down with a baby at here body and a child following them. I will recomend this guide, the company and Daniel, who cooked fantastic into the junglecamp. Janine und Dodi machten unseren Aufenthalt in Bukit Lawang zu einem Highlight unserer Indonesien-Tour! Sie organisierten sowohl den Flughafen-Transfer, als auch die Jungle-Tour und das Elefanten-Waschen. Vielen Dank, es war wunderbar in Bukit Lawang. WIR, Gäste aus Germany, Hamburg.. Bedanken uns für vier wundervolle Tage bei Dodi&Janine und dem gesamten Team. Wir haben eine unvergessliche Jungel Tour gemacht. Wurden herzlich aufgenommen und haben lecker gegessen. Das gesamte Angebot ist nur zu Empfehlen! Wir haben uns sehr wohl gefühlt. Auch waren wir am letzten Tag den Kindergarten besuchen. Wenn ihr Zeit haben solltet, die Kinder freuen sich über euren Besuch. Dieser lebt auch von Spenden und wer einmal dort war, wird sehen was für wichtige Arbeit geleistet wird vielleicht eine kleine Spende oder Süßigkeiten für die Kinder dort lassen. Wir werden definitiv wiederkommen. . In diesem Sinne, in Hamburg sagt man Tschüß, dass heißt auf wiedersehen :-) . Thanks to Janine and Dodi for the very warm welcome in Bukit Lawang and a just perfect days there. It started already with a very smooth transfer from the airport in Medan to Bukit Lawang. On the next day we started our 2 days jungle trekking - an experience we do not want to miss, and that we can strongly recommend. 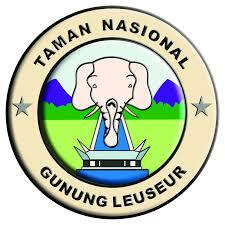 Perfect wildlife and nature, very nice guides, good food... everything you want. On our spare day before going back to Medan, we decided to go for a half day walk with Mira to experience the local life in the villages around Bukit Lawang. Some hours that we also keep in vey good memory. Zwei Freund und ich waren im August in Bukit Lawang und haben die traumhaft schöne und unvergessliche Tour durch den Dschungel gemacht! We had such an amazing time with these guys. Our guides Cendra and Lili were fantastic, especially with our two kids (aged 6 & 7) and always made sure they were safe - and well entertained! Everything was taken care of - they organized a driver to pick us up from the airport, and then Dodi (the owner) and the guides picked us up at Bukit Lawang to guide us to our guesthouse and help with the luggage. We set off the next day, saw plenty of orangutans and were fed lots of beautiful Indonesian food. The guides were very respectful of the orangutans and didn't lure them with food. We still got to see some pretty close up, including famous Mina! At night we stayed in a tent that even had some self-inflating air mattresses,so we only had to take some lightweight sleeping bags. The cook prepared some lovely food, which we all enjoyed under the stars - then he taught us a card game and we shared some stories around the campfire. Next day after a swim in the river, some songs and lunch, we took the "jungle taxi" (tyre tubes) back to the village. Rounded off by dinner at Dodi's restaurant (try the gado-gado!!). Brilliant experience that we won't forget. And a big thanks to Janine for patiently answering all my questions. This was a beautiful trip. Me and my friend booked a 3-days-tour because other travellers recommended to go minimum 3 days. Now, afterwards, I would recommend the same. We arrived at the airport. Dodi picked us up. On the way to Bukit Lawang we stopped in a little restaurant to eat something. On the next day we started our tour with Nico and Lili. Really funny guys. With Nico you can talk good english. He can understand a lot and tell a lot about the jungle. You feel that they really care about "their" forest and they're not just doing their job as a tourist-guides. Lili carries a load of fruits (mandarines, pineapples, bananas, passion fruits, ...) and tasty lunch in his backpack. We were so well-fed! We had a really lucky tour. 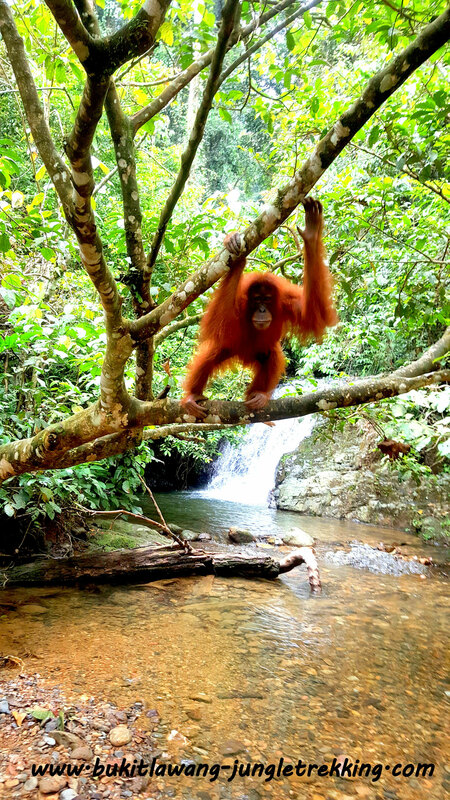 We've seen wild orangutans and gibbons really close. When we arrived back in Bukit Lawang there was a really funny party at the Indah restaurant, because of a birthday of a foreign student. So funny to sing, drink and play guitar with all the guides, Dodi and other residents of bukit lawang. Definitely the most intense connection with Indonesians. Really great! 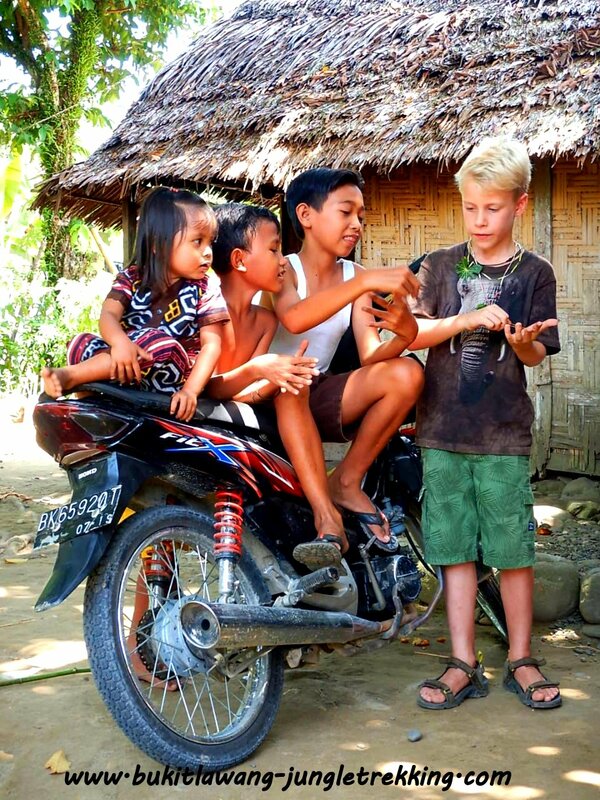 All in all this was one of the best tours I did in Indonesia because of the deep and intense touch with the nature. Thank you very much Nico and Lili for the guide, Alan for the tasty food and the organisation of our stays in the jungle camps and Dodi and Janine for the booking and the organisation. As a Dutch family with two teenagers, we did a five day jungle tour. The tour was amazing because we really saw a lot of the jungle. 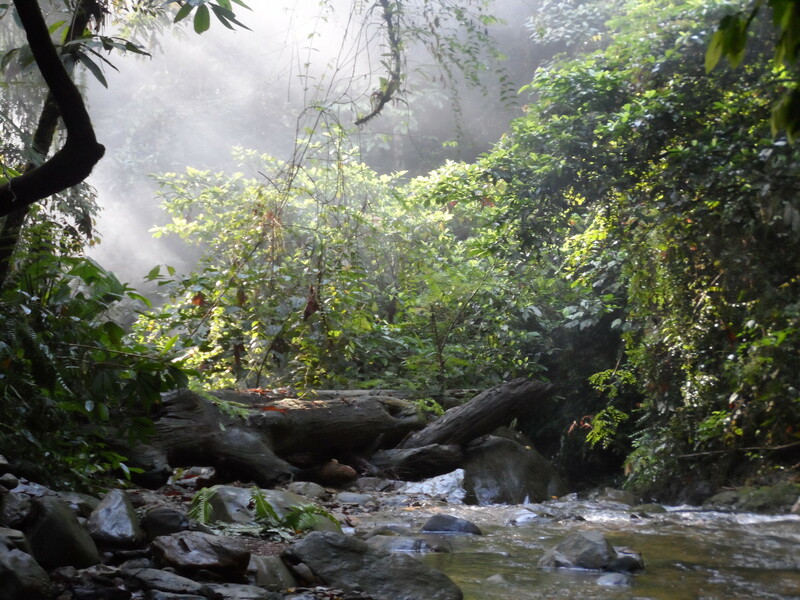 Wild and semi wild urang-oetangs, black gibbons, beautiful birds and the sleeping spot of the tiger. The guides were very professional, kind and good cooks. We have enjoyed every minute of the tour. 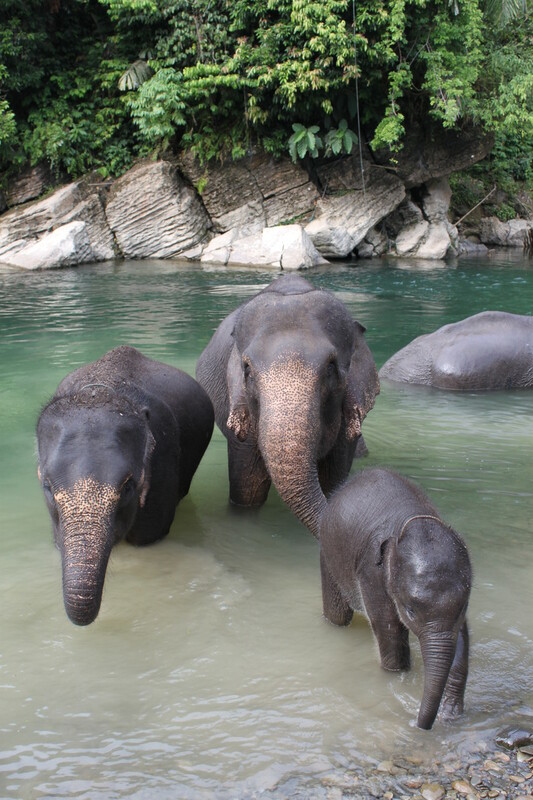 Besides this tour, we did some elephant riding and wild water rafting. Everything was organised very well. 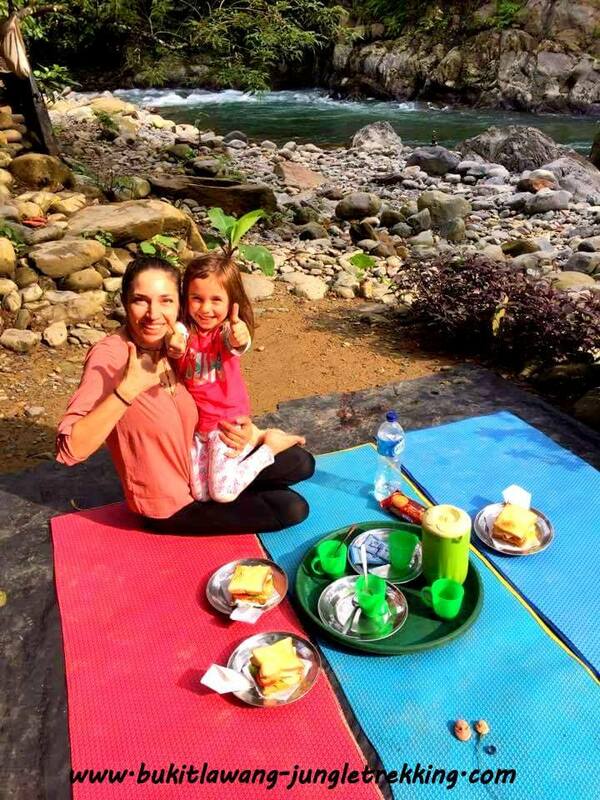 Dodi and Janine know how to make you welcome and comfortable as guests in Bukit Lawang. 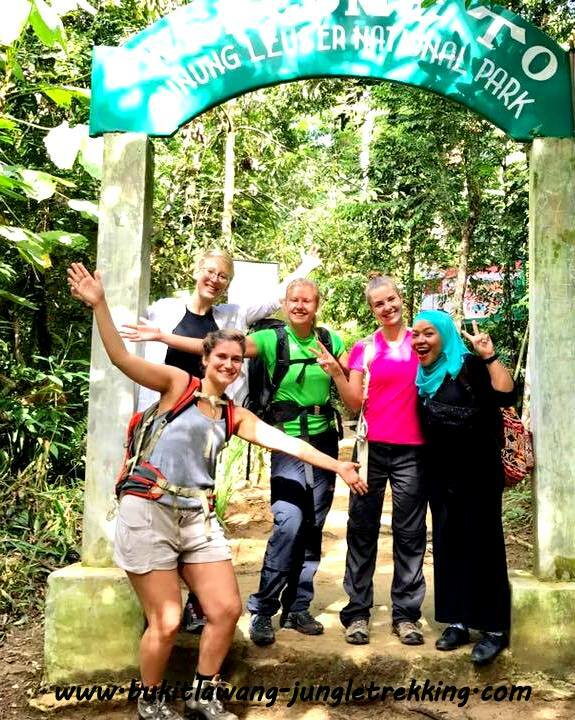 With my sister, her son (17), daughter (14) and my daughter (17) I did the 3-day jungle trek. An unforgettable experience! The trek through the jungle was pretty tough, but for everyone to do in our company, with great thanks to our guides Johnny and Harry. The food during the trek was fantastic, amazing what the cook and the guides conjured forth in the rainforest. The atmosphere in our group was very good and relaxing and we always felt safe. Dodi and Janine have everything well organized (eg staying in Bukit Lawang ) and are also very friendly and helpful. Recommended! Met mijn zus, haar zoon (17), dochter (14) en mijn dochter (17) deed ik de 3-daagse jungletrekking. Een onvergetelijke ervaring! De tocht door de jungle was best pittig, maar voor iedereen in ons gezelschap te doen, met grote dank aan onze gidsen Johnny en Harry. Het eten tijdens de trekking was fantastisch, geweldig wat de kok en de gidsen tevoorschijn toverden in het regenwoud. De sfeer in onze groep was heel goed en ontspannen en we voelden ons altijd veilig. Dodi en Janine hebben alles goed georganiseerd (o.a. ons verblijf in Bukit Lawang) en zijn daarnaast ook heel vriendelijk en behulpzaam. Een aanrader! We had a very good jungle trekking with a group of 5 people, 2 guides and (in the evenings) a cook. The trek was though, but beatifull. We saw a lot of wild life, such as orang-utans (friendly, but also less friendly ones), a turtle, other monkeys, varans, and even a cobra! The giant ants were also amazing! The guides, Johnny and Harry, were very professional, and at night they turned out to be good entertainers as well. Our cook managed to prepare real good food out there in the jungle! Also the sight of it was amazing: fruit made up with flowers etc. Dodi and Janine were really friendly and helpfull. We had a wonderful time! We kwamen op maandag, einde van de middag aan in Bukit Lawang. Dodi stond ons op te wachten en we werden gelijk geholpen met onze zware koffers. We werden uitgenodigd voor een welkomsdrankje in het restaurant van zijn ouders, we voelden ons gelijk welkom. We stelden wat vragen over de trekking en kregen duidelijke antwoorden. De volgende ochtend maakten we kennis met onze twee gidsen, Johnny en Harry, waarmee we 3 dagen en 2 nachten de jungle in zouden gaan. Het was warm en zwaar maar de gidsen lieten ons genoeg drinken en rusten en ze wisten heel veel te vertellen over alle geluiden en beesten die we zagen en hoorden. Ik heb me geen moment onveilig gevoeld. 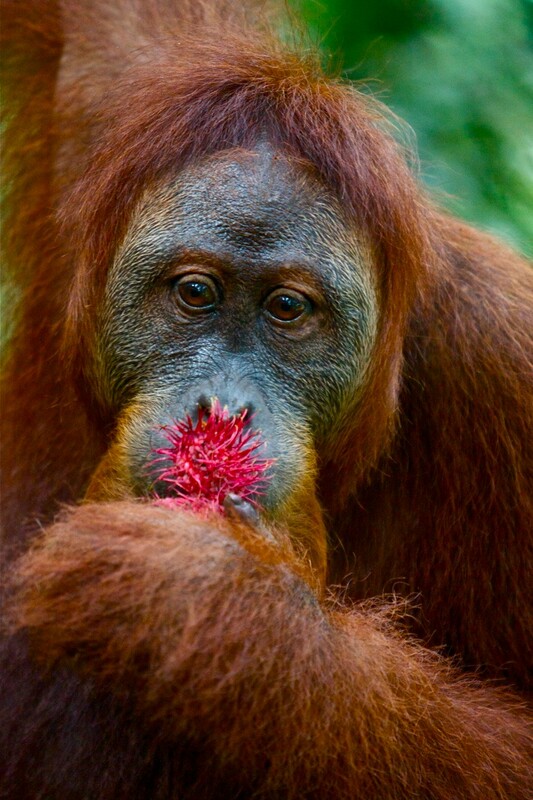 We hebben wilde en semi wilde orang utans gezien.het eten was ontzettend goed en we kregen elke dag veel vers fruit. 'S avonds deden we spelletjes, het was allemaal heel gezellig!! Al met al was het heel zwaar maar ik zou het niet gemist willen hebben! We arrived in Bukit Lawang in the afternoon on a Monday. Dodi was already waiting for us and we immediately people helped us with carrying our suitcases. We got a welcome drink from Dodi in his parents restaurant, we felt welcome and at comfortable. We had a few questions about the trekking and the answers were clear and satisfying. The nest morning we met our guids, Johnny and Harry. We went for three days and two nights. It was warm and though, but our guides made sure we had enough rest and we drank enough water. Johnny and Harry knew a lot about all the animals and their sounds, all the plants etc. I never felt unsafe, they were very alert all the time. We saw wild and semi wild orang utans. The food was very tasty and every day we got a lot of fresh delicious fruits. Sometimes it was though but It was all worth it! 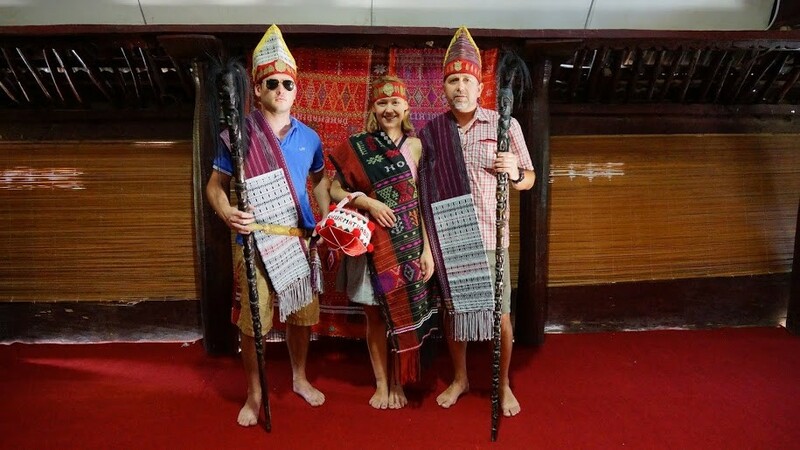 Ich kann mich meinen Vorschreibern nur anschließen: ich habe mich wahnsinnig wohl gefühlt im guest House bukit lawang indah, das essen war einfach fantastisch, so gut wie dort, habe ich die ganzen 3,5 Wochen in Indonesien nicht mehr gegessen. Die Betreiber des guest House und vor allem deren Sohn Dodi und dessen Frau Janine, eine deutsche Auswanderin, waren absolut herzlich und hilfsbereit. Wir haben u.a. eine zwei-Tages-Tour in den Nationalpark gemacht. 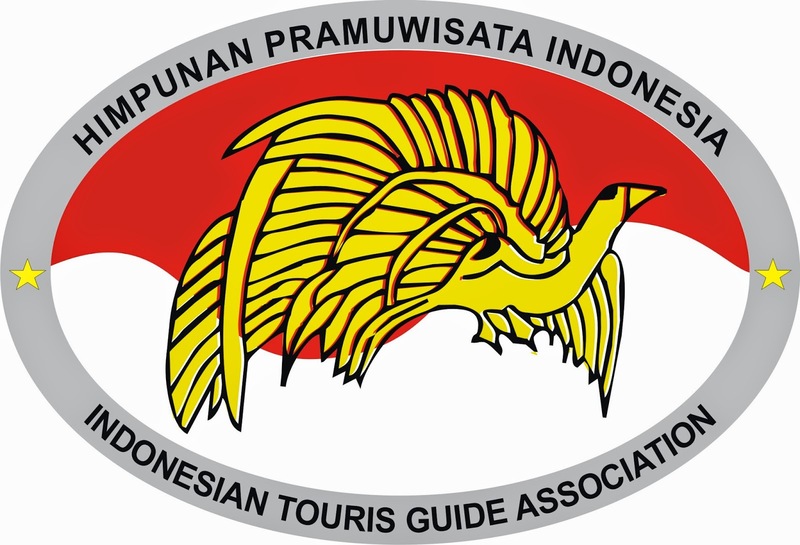 Die Tour war echt klasse: top organisiert, mit englisch-sprechenden guides aus Sumatra, wieder sehr gute Verpflegung und natürlich die Highlights: zahllose wilde Tiere, die man in unmittelbarer nähe erleben kann. Meine favourite war eine Black Siamang Mutter mit Kind, aber natürlich auch die Orang-Utans, tukane und vieles mehr. Also, absolut empfehlenswert, ich würde jederzeit wieder genau dasselbe buchen! zuerst einmal muss ich erwähnen, dass wir diese reise mit einer gewissen erwartungshaltung angetreten haben (aufgrund der positiven vorberichte). aber was wir hier alles erleben durften, ist einfach nicht zu toppen. pünktlich wurden wir am flughafen medan vom pick-up-service abgeholt. unser quartier bezogen wir im guesthouse bukit lawang indah. die zimmer dort sind zweckmäßig eingerichtet, sauber und äußerst geräumig. zum guesthouse zählt auch ein restaurant. es bietet eine große auswahl an einheimischen und internationalen gerichten. so gut wie hier haben wir nirgendwo anders in bukit lawang gegessen. das guesthouse sowie das restaurant werden liebevoll von dodis eltern betrieben. dodi und seine deutsche frau janine wohnen auch im ort und organisieren von dort aus alle trekking touren. wir haben uns vorab schon für die 2-tage-jungle-trekking-tour entschieden und wurden nicht enttäuscht. die zahlreichen tierarten, die wir hier beobachten durften, waren zum greifen nahe. trotzdem haben die local guides stets darauf geachtet, den lebensraum der tiere nicht zu beeinträchtigen. die sichtung eines orang utan jungen im schlepptau seiner mutter war das absolute highlight der tour. alle local guides sprechen fließend englisch, kennen sich bestens mit der einheimischen pflanzen- und tierwelt aus, kümmern sich um die komplette verpflegung und sind immer für einen spaß zu haben. der krönende abschluss der zweitätigen tour war die wildwasser-tubing-fahrt zurück nach bukit lawang. auch andere touren wie das elephant-camp im tangkahan, die besichtigung der bat caves und ein schländern über den wochenmarkt sollte man sich auf gar keinen fall entgehen lassen. zur unterkunft sei noch gesagt, dass fast täglich spontane spiele- und musikabende geboten sind, auf denen einheimische zur gitarre greifen und zum mitsingen animieren. generell herrscht einfach eine sehr herzliche und lustige atmosphäre und man hat wirklich das gefühl, dass dodi und janine das wohlbefinden ihrer gäste sehr am herzen liegt. wir waren bestimmt nicht zum letzten hier! Einfach fantastisch, herzlich und unvergesslich! Wir wurden bereits am Flughafen zuverlässig und pünktlich abgeholt. Der Empfang war gleich ganz herzlich. Das Hostel in dem wir schliefen " Bukit Lawang" war auch grossartig. Und die Tour durch den Dschungel mit den Guides war absolut faszinierend und unvergesslich. Vielen dank für die tolle Betreuung. Wir kommen auf jeden Fall wieder. best personal treat and knowledge! the treck was really interesting, the apes breathtaking and also the food prepared by the guides was great! the couple organising the tours will help you with everything you need in advance - thank you Dodi and Janine! always would do it again with them!! Wir waren vier Wochen im August 2014 in Indonesien unterwegs und unsere zweite Station war Bukit Lawang um eben eine Tour durch den Dschungel zu machen. Wir haben uns für die 2-Tages-Tour entschieden. Ich selbst könnte mir auch eine längere Tour vorstellen, wobei für meine mitreisenden die 2 Tage ausreichend war. Würde den Dschungel-Trek auf alle Fälle wieder machen. 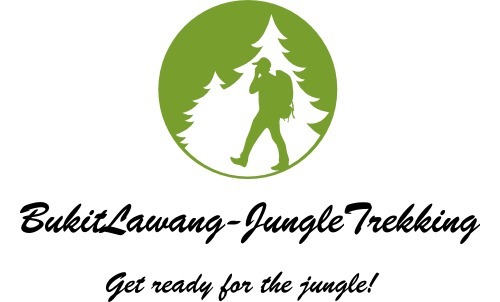 My boyfiend and me decided to make a 3 days / 2 nights junlge trek in bukit lawang. It was really easy to organise for us because we only had to tell our arrival at the airport. A driver picked us up from the airport and about four hours he delivered us to our accomondation for the first night at Bukit Lawang Indah. We talked with Dodi and he explained us lot's of interesting facts about the jungle. At the next morning we stated our trek with a nice couple (thanks to Jikra & Martina for being a great team) and the crew from jungle Eddie (Tara, Marcel and Herman, thank you so much :)). It's really hard to hike and climb up and down always, but that's nature. We are not the sportiest persons in the world however we did it! 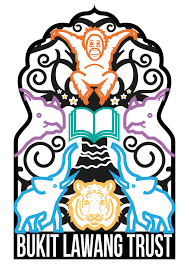 Everyday we have seen animals like macaque or orang utan. It's like an other world to see this animals in their home, so this time humans are visitors. It's not like a zoo. 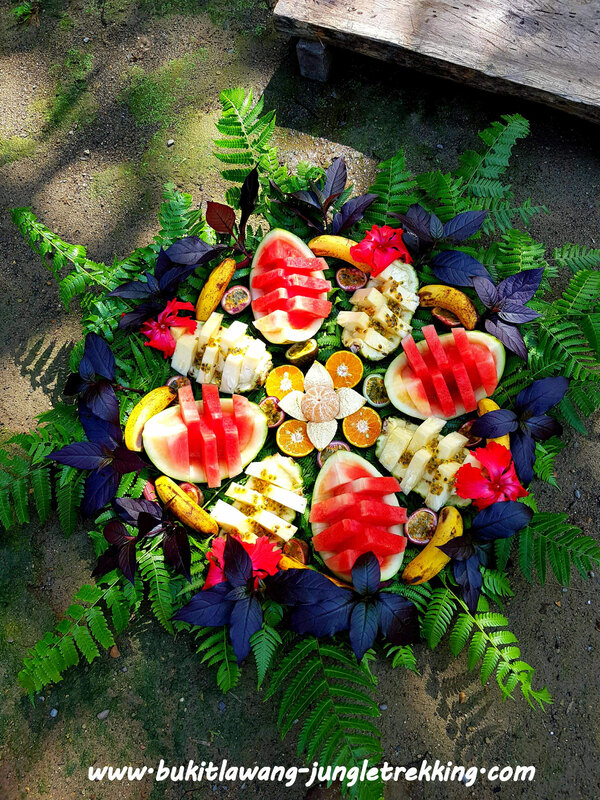 You can try the fresh fruits from the jungle and see the primal life. The crew always cared about us in every situation. They carried our lunch, helped us to walk trough the rivers and climbing. It was our first jungle trek and we decided to make a longer one the next time in the future. I olny can advise it!!! 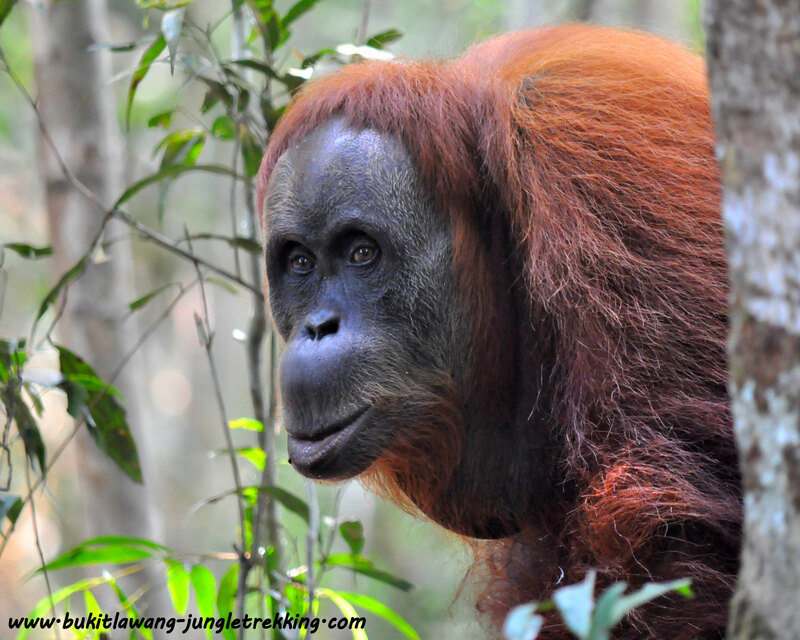 We did a private trek in late July 2014 spending 4 nights in the Jungle, which was very nice as we got to go deeper into the forest, had been fortunate enough to see truly wild Orangutans and were virtually alone for almost 3 days. If you have the time and love nature, we would definitively recommend to go for a longer tour. 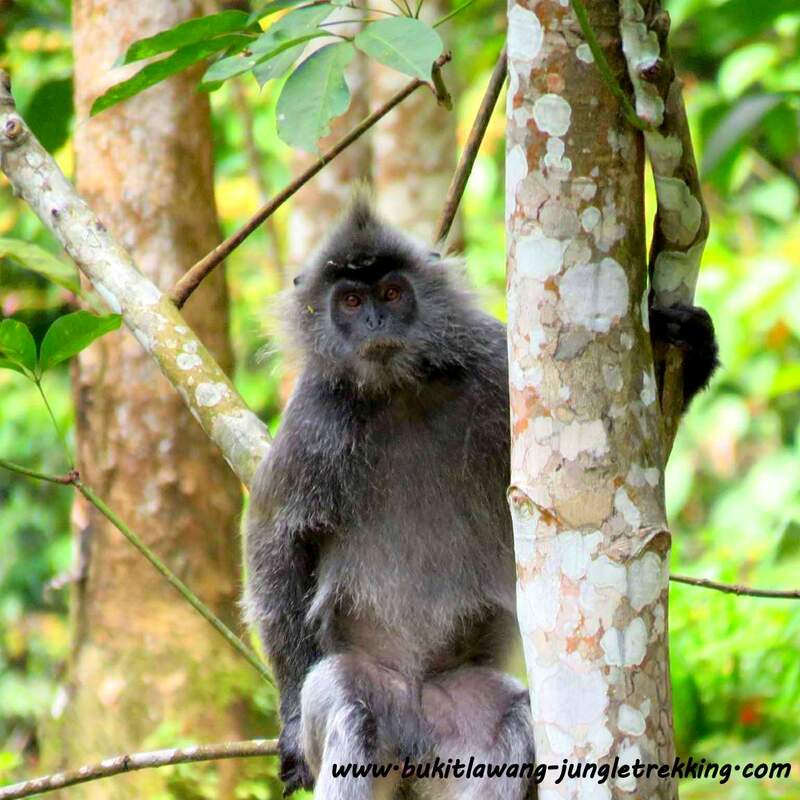 The area immediately surrounding Bukit Lawang can be somewhat busy with tourists, particularly at feeding times and around the places frequented by the semi-wild Orangutans and you initially have to pass through some plantations. However, once in the park, we absolutely enjoyed the pristine forest, the stunning camp sites that our guides picked each night, the excellent food that they prepared for us and the spectacular wildlife we were able to observe. As for the organization, Janine & Doni managed everything very smoothly even though we booked on very short notice. 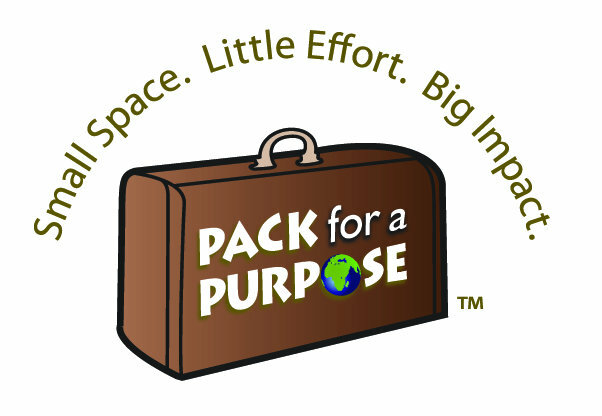 Airport pick-up and drop-off, organization of a team of three very knowledgeable, kind and fun guides/cooks/porters, shoes for hiking (for 1 Euro) as well as accommodation in Bukit Lawang in their guesthouse for two nights (basic and functional, with a good restaurant). 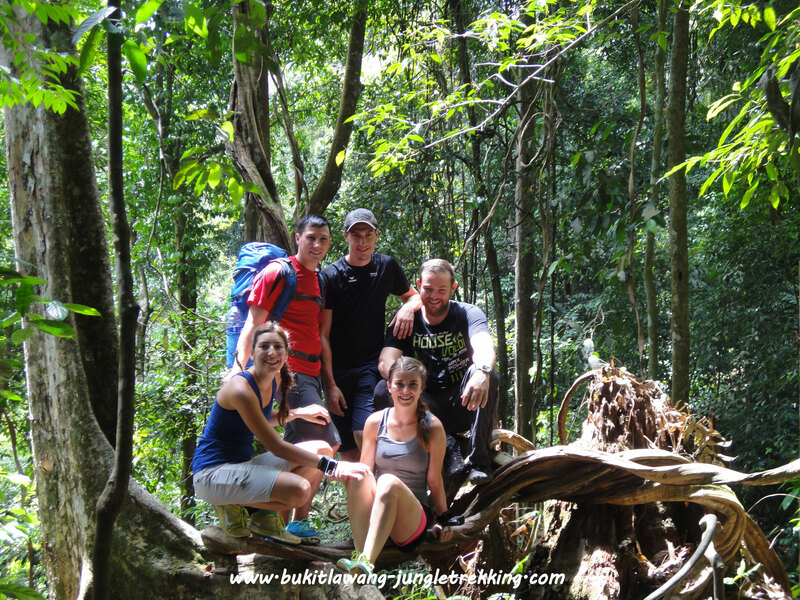 Amazing jungle trekking with bukitlawang-jungletrekking. 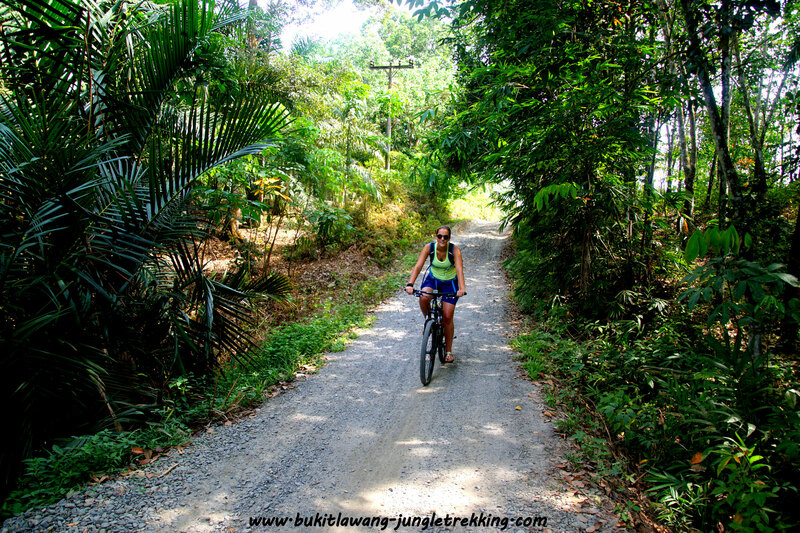 We had the most wonderful week in the jungle and at bukitlawang-jungletrekking guesthouse. 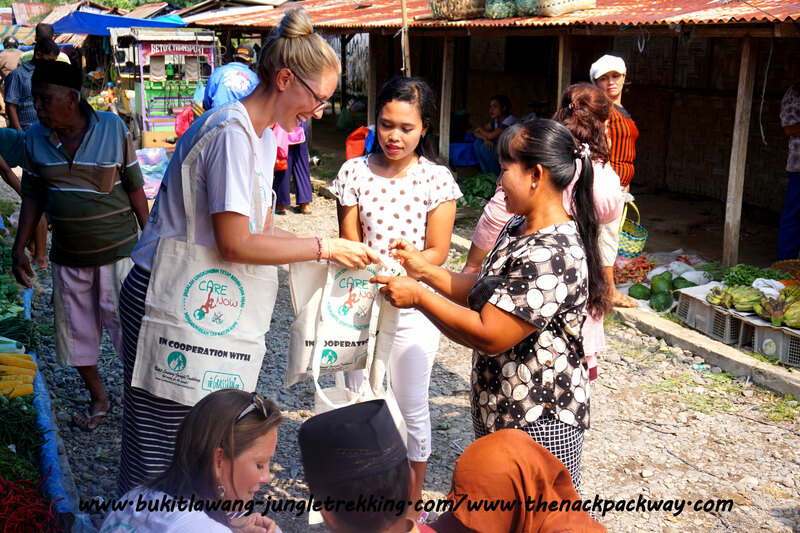 We had newer met any of the people from bukitlawang-jungletrekking before we arrived and they proved to be the nicest, friendliest people you can imagine. Ask to talk to Janine, Dodi or the guide Johnny and they will make sure you get an amazing stay. We saw plenty of wildlife including Thomas leaf monkeys, gibbons, orangutans, peacock, monitor lizard etc. 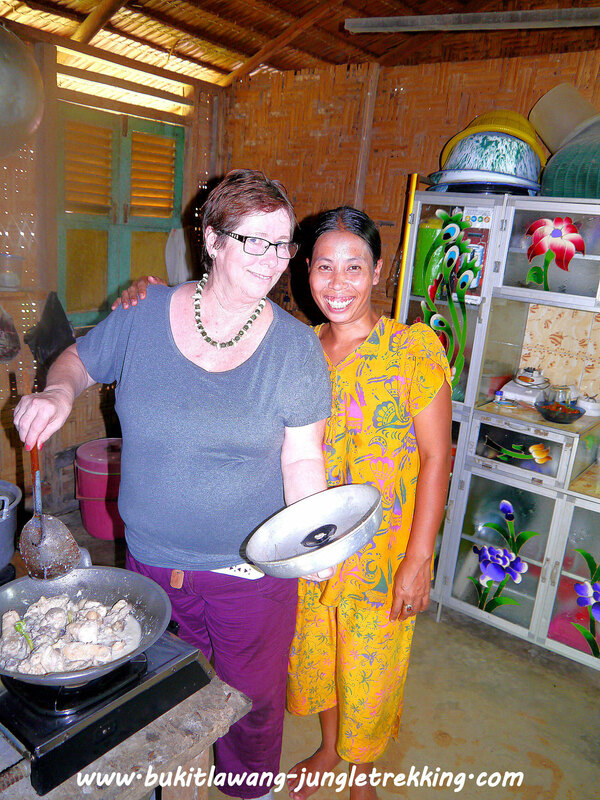 and in the evenings they cooked the best food while telling us the local tales and jokes. We came a bit unprepared and were met by people who just wanted the best for us. They went around town to make sure we had proper trekking shoes and only charged 1 Euro for them. They provided extra blankets and even borrowed us their personal bag because we were one short. If you want to be in good and fun hands while experiencing the jungle and wildlife we can only recommend bukitlawang-jungletrekking. I spent a day in Bukit Lawang in March 2012 and was lucky enough to be taken into the jungle to view the wild Orang Utan by Adi our guide ( Bukit Lawang Jungle Tecking ) and experienced a fantastic event when we located a mother with her young one on her back in the Jungle high up on the mountain. This was an experience I will never forget and we were able to view these beautiful animals in their wild state and from a very close up position. Adi and his family are lovely people and very good at what they do and you are made to feel very welcome. I felt it a privilege to be with them in this most beautiful part of the world and hope to get back there one day with my family to show them what I was lucky enough to see. I can absolutely recommend this once in a lifetime experience to anyone who wishes to experience what is becoming a very rare event and feel sure you will be as thrilled as I was. Adi and his family will ensure you are well looked after in their beautiful village. 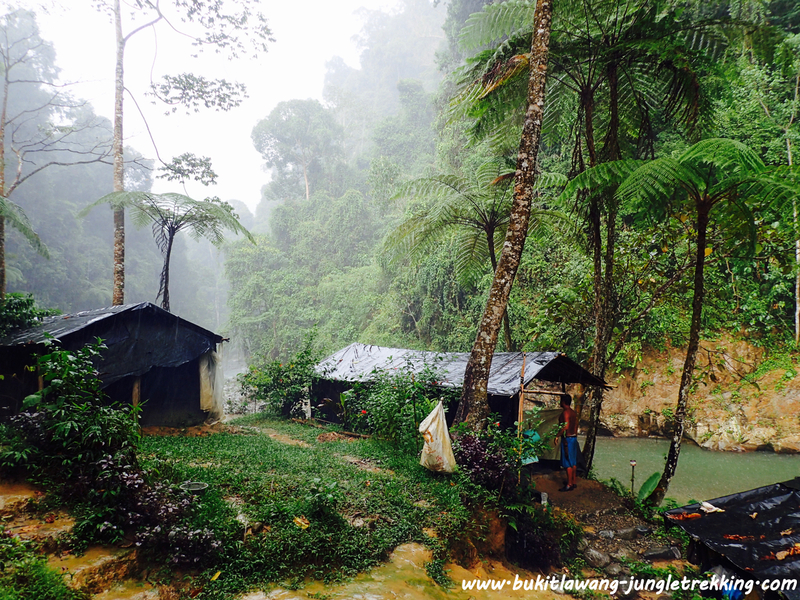 We spend approximately a week in Bukit Lawang and did a three-day-trip through the jungle. It was awsome! Our two guides took really good care of us and showed us all the variety of mammals, insects and explained trees and plants. The food-supply and the organisation was perfect. They will help you with everything. They have they own restaurant and accommodation, which I can just recommend! We had a awsome time! Exelent séjour dans la jungle. Une rencontre très émouvante avec les oran-outang et tous les autres annimaix du parc. Une équipe super sympa qui sait s amuser et partager ses connaissance de la jungle . Il faut pas hésiter a se promener dans le village a la rencontre de population. 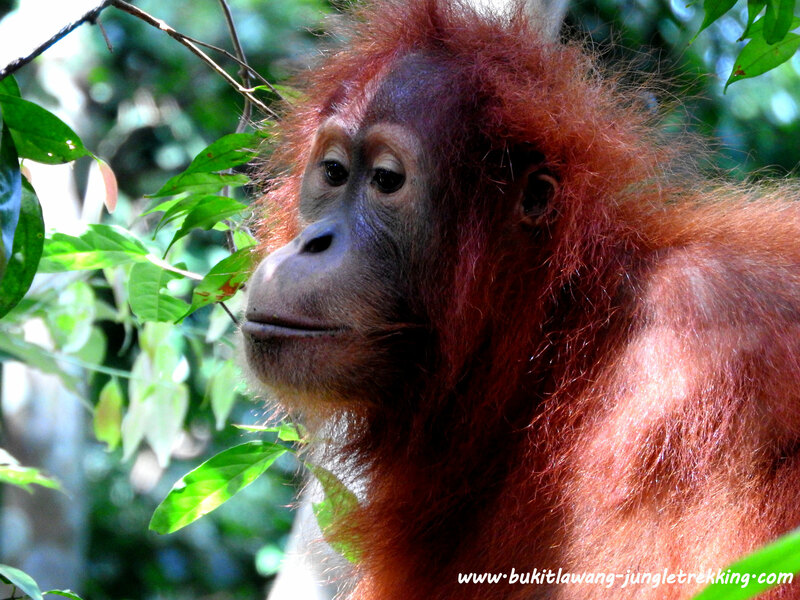 We stayed in Bukit Lawang in early February this year. The people here are really friendly and helpful. We did the two day jungle trek and were really happy with it. It was our best experience in Indonesia. The wildlife we saw was spectacular in the middle of a real green jungle. The jungle guides ate really fun and know alot about the jungle and the animals.. We recommend it to anybody travelling around Sumatra. I went to Bukit Lawang with my friends yesterday. We'd done the half-day trek and we had so much fun. You guys are so friendly and we are planning to go there again for the overnight trip in the jungle. So i guess see you guys soon! and thank you. Me and my cousin went there for 3 nights including an overnight trip to the jungle. We had an awesome time in the jungle as well as at the guesthouse. 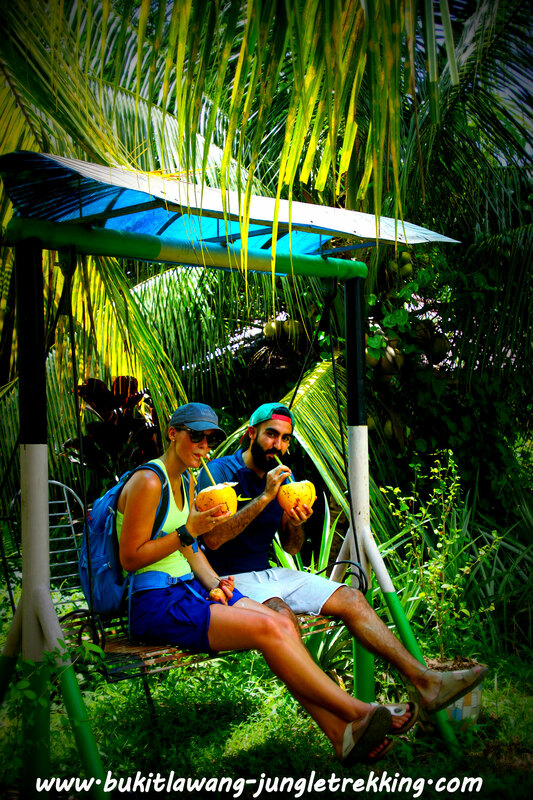 The guides and the local people will make your stay unforgettable and you will love the people and the jungle adventure!!! Bukit lawang was my first destination of a one month journey trough Sumatra. I have done the three day trekking and it was amazing. 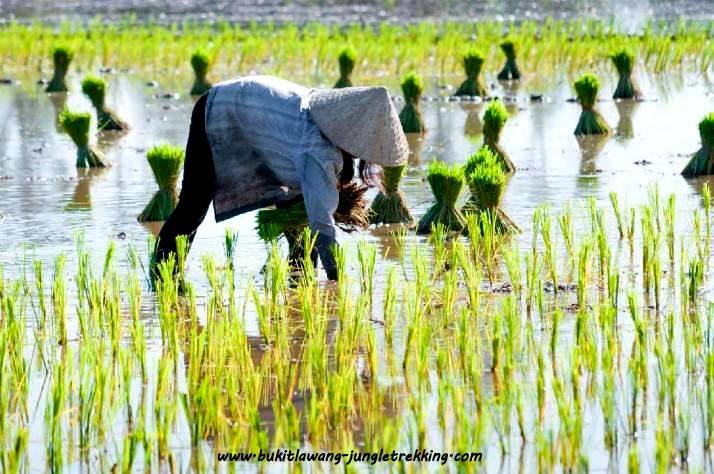 Instead of planed three days in built lawang I stood for a week. Very nice atmosphere and the people really cares for their guests. I can recogment everybody to visit this awesome place. Thanks again to the hole guesthouse Indah crew for making my stay unforgettable!! !